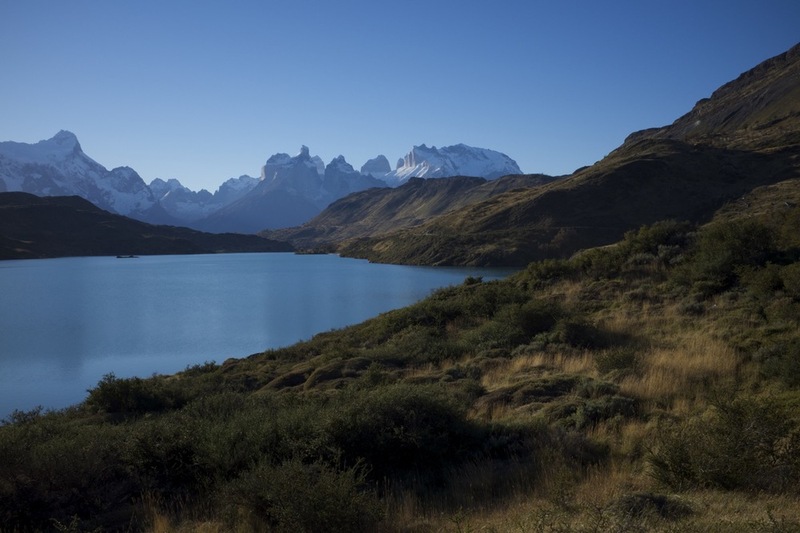 Stroll in the Park: Breath-Taking Hikes in Torres del Paine — 2checkingout | travel and adventure | Inspiring. Capturing. Experiencing. The next part of our trip required military planning. 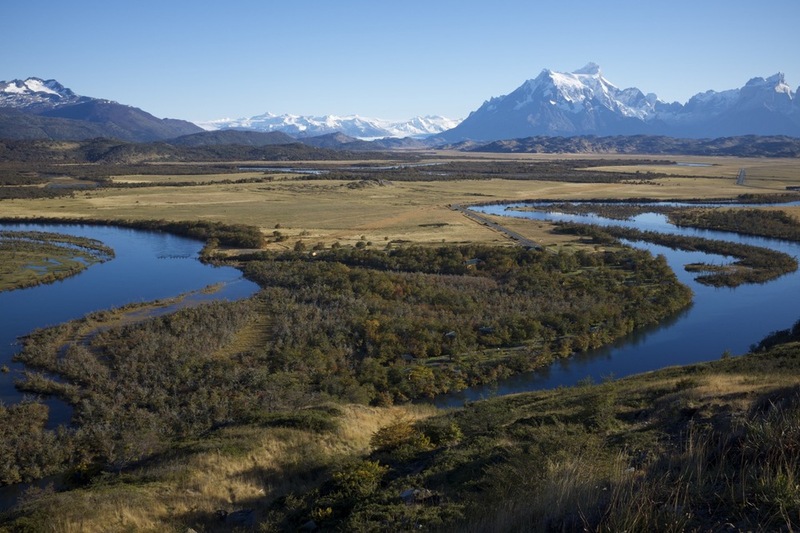 We are heading to southern Chile and the Torres del Paine National Park. To get there we need a taxi, bus, taxi, plane, taxi, bus and finally a hire car. Throw in a volcano erupting close to the flight path and you have the makings of a long day. But we had it all figured out. Well, kind of, best laid plans of mice and men and all that. We made it to the airport OK but then things turned a little sour. Turns out an email received 5 days ago by yours truly was important. If I had translated the Spanish I would have discovered that our tickets weren't, in fact, booked. I just thought it was marketing junk. Oops. The next available flight was in 4 days! Turns out every man and his dog wanted to get up close to the volcano. There were news crews from just about every global TV network trying to get to the same place as us. The words ‘I’m really not happy with you right now’ leaked from Julie’s terse lips. We had booked and paid for accommodation and return flights to Buenos Aires and here we were pacing Santiago airport. I was lucky not to have been throttled. Once the mist lifted we started to look at options. We even contemplated canning the trip south but we were both keen to experience Las Torres. 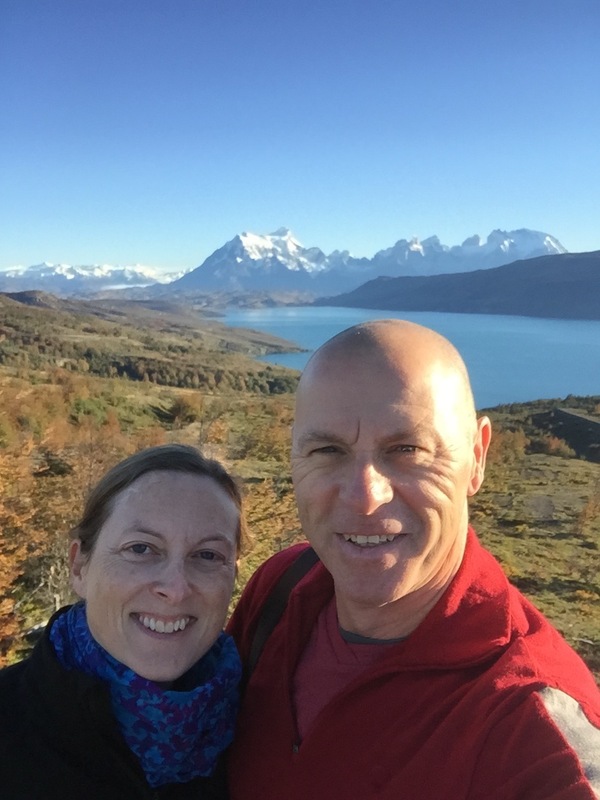 We ended up flying via Buenos Aires and El Calafate (Argentina). Followed by a 4 hour drive back into Chile at Puerto Natales. Just one small snag, a 14 hour wait for our flight and a 5 hour layover in Buenos Aires. Loving this travel marlarkey! Turns out you can make a coke and plate of chips last a very long time when you are trying to kill 12 hours in an airport. We did have the pleasure of a protest by the airport workers. They paraded through the terminal, drums beating and trumpets blaring. The protest led by the obligatory stray dog. We arrived in El Calafate some 28 hours after we had left Valparaiso. Neither of us had slept more than an hour. We waited around for the car hire desk to open only to find that our booking was at the town office, 20 km away. The last bus had left already so we jumped in a cab. Could our day get any better? Driving on the wrong side of the road for 4 hours on less than an hours sleep was a little taxing to say the least. The scenery for the most part was stunning. We had not long left town when the first wildlife appeared in the form of guanaco’s. These are llama like animals, sometimes called woolly camels. These and rheas were common place as we headed back towards Chile. Our first land border crossing went without a hitch. Just a case of queuing to get the passport stamped and then a separate queue to get the right paperwork to take the car through. We arrived in Puerto Natales shattered but just about back on track for our initial itinerary. The next day we were up bright and early for the drive to the national park. The first few kilometres out of town were like driving on a racing circuit. This quickly gave way to a road that would have had a Chieftain tank struggling. We came across a huge bird of prey devouring a hare at the side of the road, complete with smaller birds fighting over the intestines. Not sure if this was a condor or not but it didn't flinch when we drove up and took some photos through the car window. Our first glimpse of the national park took our breath away. Rounding a corner to a view of snow capped mountains and brilliant sapphire lake set against a clear blue sky. We were visiting the park right at the end of the season and much of the accommodation had closed for winter. We ended up with a two bedroom cabin just a few minutes from the park entrance. Not wanting to waste anytime we dropped our bags and headed off for our first stroll. Julie had already been reading up on the best short hikes. Things work well when Julie does the prep. We were also eager to test out our new walking boots purchased in Santiago. Our first hike was a two hour return trip to Mirador Cuernos (lookout of horns). This took us passed Salta Grande (waterfall) and onwards. The people around us evaporated and we had the trail pretty much to ourselves. The walk wasn’t at all taxing but it was good to stretch our legs after the hours spent at the airport and the long drive. The view at the mirador was stunning. An added bonus was the After Eight mints offer by some locals who were having a picnic, all very civilised. On the way back we stopped to climb Mirador Condor. This is a 45 minute uphill slog that offered a spectacular 360 degree view. Right on cue a condor circled overhead as we clambered up the last few metres. The next day we climbed out of bed before sunrise to head further into the park to tackle the Mirador Base de las Torres. The second highest hike in the park. In the pre-dawn light we saw foxes, skunks and heaps of European hares (Condor food). It was going to be a long day. The hike itself is only a 20 km return trip. But it’s 4 hours each way due to the elevation. The walk had five distinct sections. The first was an amble over fields and across a swing bridge which then turned upwards. There had been a lot of rain the week before. So much rain in fact that areas of the park had been closed due to flooding. Thankfully the skies had cleared and the sun had made an appearance. We tiptoed around the water and mud trying not to get our new waterproof boots wet, townies. The second section was along a narrow shingle path half way up a hillside. The path led you into a valley and to a camp ground. The third along a forest lined river, we almost skipped along the sun dappled path. So far so good, our hearts were getting a good workout and the knee was holding up. The fourth section began with a sign that stated that we were just 45 minutes from the summit. Well, those 45 minutes turned into one and half hours and the longest kilometre of our lives. We clambered up a uneven staircase of rocks. Claustrophobically encased in greenery with a carpet of running water. There was little in the way of signs to show us we were on the right track. This wasn't a walk it was a Royal Marine endurance test. When we came to a clearing we presumed the worse was over. No such luck the final section was a boulder field, with rocks the size of small cars. 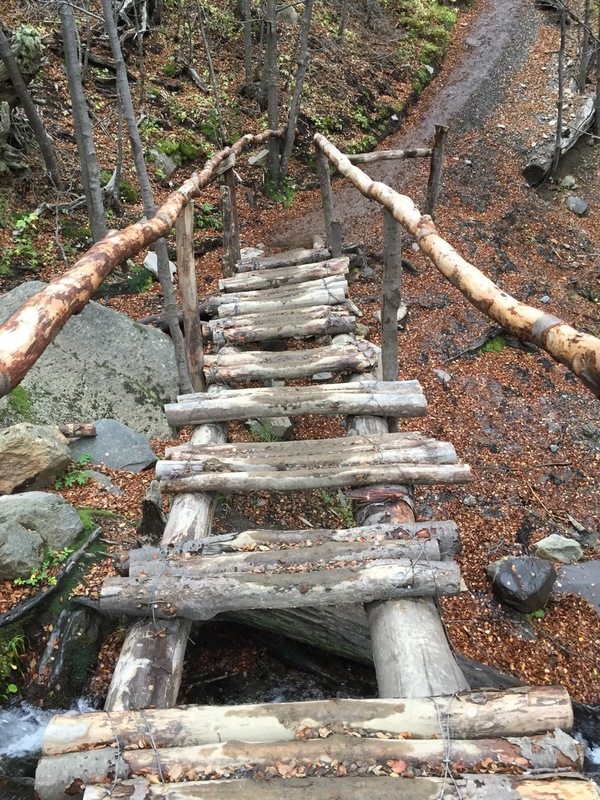 Who the heck mapped out this hike? Even a mountain goat would have worked up a sweat. Just when we thought it will never end there in front of us were the majestic old girls of the park, las Torres. These three granite columns are only visible in all their splendour by taking the hike we had just completed. The towers rise above a lake, the light changing the complexion of each with every passing minute. We had started at an elevation of 132m and finished at 886m. An overall gain of 994m's. It may not sound a lot but when the last 1 km is almost vertical it sure felt like we had climbed to the moon and back. Being conscious of getting back to the car before dark we didn't hang around too long. Just enough time for a snack and a few photos. We both felt that the descent was as hard as the climb up. My knee was now the source of some discomfort and needed stretching every couple of kilometres. We made it back just as it turned dark. Caked from head to toe in mud and sweat, we went up the hill novice hikers and came down the mountain as seasoned professionals, yeah right. We fell into the car completely spent and drove the 1 hour trip back for a well earned pile of pasta and glass of red. Next Stop El Calafate, for some ice, ice baby.